At its third annual AARP Network of Age-Friendly Communities conference held in Washington, D.C. on September 1 and 2, AARP unveiled new resources for cities, towns, counties and neighborhoods that want to be great places for people of all ages. The AARP Network of Age-Friendly Communities has over 60 member communities, from New York to San Francisco, and reaches over 31 million residents. The network is part of AARP’s Livable Communities strategies, research, programs and resources. AARP looked at efforts in the United States and worldwide to identify 16 good practices that are worth sharing and, when possible, replicating. The featured communities are all members of the AARP or WHO Networks of Age-Friendly Communities – often both. This NEW online collection provides fact sheets, tool kits, guides, reports and more across all 8 Domains of Livability in the Age-Friendly framework. A package of comprehensive, easy-to-read, award-winning livability resources, the 11 fact sheets can be used by community leaders, policy makers, citizen activists and others to learn about and explain what makes a city, town or neighborhood a great place for people of all ages. The Livability Economy: People, Places and Prosperity (aarp.org/livability-economy)This report (and accompanying infographic) shows how livability initiatives contribute to improved economic performance and a more vibrant, desirable and competitive environment for housing and commercial investment. 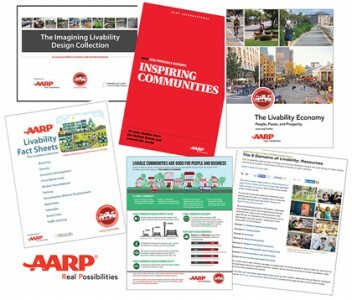 The Imagining Livability Design Collection (aarp.org/livability-design)This guide describes some of the most common tools and treatments for creating age-friendly built environments. Dozens of “before and after” photo visions help to develop a shared vision for the future and act upon that vision. Additional resources can be found at aarp.org/livable. Visit aarp.org/livable-newsletter to subscribe to the free, award-winning AARP Livable Communities Monthly eNewsletter.